We approach the half-way point in a thrilling new era of Formula 1. New cars, new faces at the top and new championship battles. Much of the story of the season to date has been about the titanic duel between Mercedes’ Lewis Hamilton and Ferrari’s Sebastian Vettel. In Austria, Hamilton’s team-mate Valtteri Bottas (who amazingly is yet to be signed for 2018) made his ambitions very clear also. But under the radar, a third team has shown that it is likely to feature frequently for the rest of the year in F1 2017’s championship fight, and that is Red Bull Racing. The 2017 regulations, which has produced epic levels of downforce, was expected to play right into Red Bull’s hands. It didn’t quite seem to have gone according to plan though when F1 reached Australia for the first race of the season. Red Bull was closer to the midfield than it was to the front of the pack in qualifying, and Max Verstappen had a very lonely fifth-placed finish. As a matter of fact, that would be the closest Red Bull would get to the front two teams in the first five races. In the subsequent four races, it have been within half a minute of the winner at each of the races except for the Canadian Grand Prix. 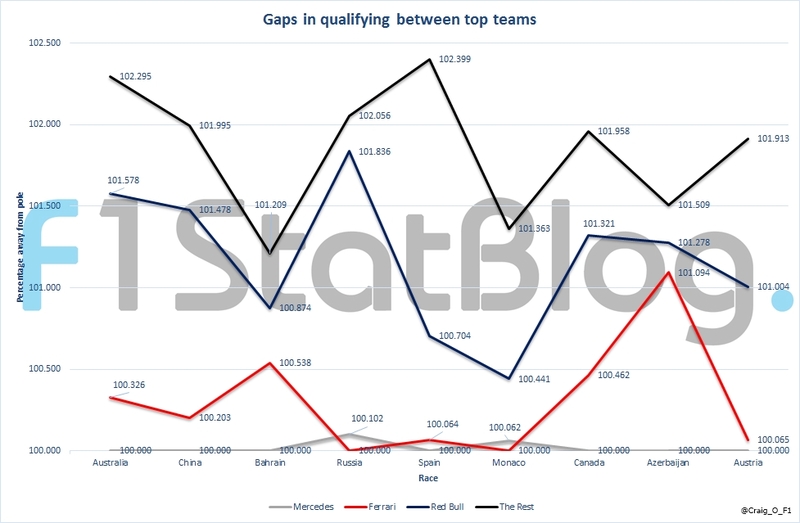 The graphs below show the gaps of the first driver from each team (as well as the best of the rest) to the front in qualifying (as a percentage) and in the race. NB: the best of the rest’s time for the Spanish Grand Prix was taken from Lap 65, as Sergio Perez was a lap down at the finish. Red Bull cited ‘correlation problems’ for some of its poor form at the start of the season. The Renault power unit is also not quite as strong as the Mercedes or the Ferrari unit, notably in qualifying (something the graphs reflect). A recent Renault upgrade has helped things, especially in the races. 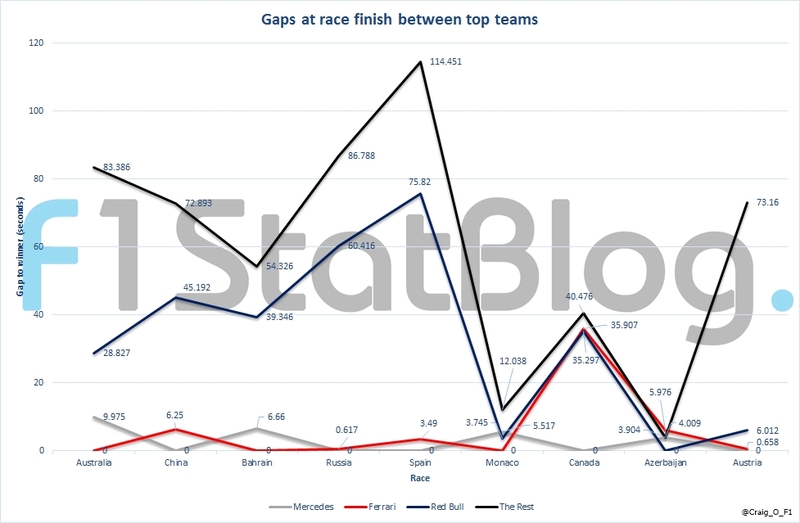 Red Bull was not far off Ferrari and was certainly quicker than Mercedes at Monaco in race trim. It was expected to be strong there, but it was also expected to be strong at Spain. But instead of fighting for victory, Daniel Ricciardo instead almost finished a lap down. The Azerbaijan Grand Prix was a tough one to read. All six of the cars from the top three teams had some sort of issue (self-inflicted or otherwise) during the race. Some of the midfield teams had issues as well. Ultimately Ricciardo won the race for Red Bull, despite being 17th at one point. The car was strong that weekend, and could well have challenged in normal circumstances. The real telling race was last weekend’s Austrian Grand Prix, Red Bull’s home race. Red Bull traditionally has performed poorly at its home event, yet Ricciardo was able to feature strongly in the race. He took a fine third ahead of Hamilton and Kimi Raikkonen. This might imply that Red Bull, should it and Renault keep showing improvement in a rapid development race, could well fight for more than fifth and sixth at races such as Hungary and Singapore. Both are tracks it has performed well at in the past, and the recent performances would imply that it is expected to feature there. Ricciardo and Red Bull sit 64 and 135 points behind in their respective championships. So a comeback at this stage is perhaps now out of the question. But there is no reason why further podiums and even race victories cannot be achieved. All of this will give headaches to the championship protagonists and could have a major effect on the outcome of who comes out on top. As opposed to dropping seven points in a race, a driver could now see the points battle swing by 17 points in a race. If Red Bull turns up and dominates a race, then a swing of only three or even two points could happen at a race. This might be problematic for Hamilton, who is attempting to close up a 20-point gap to Vettel in the championship. Bottas is a further 15 points behind, and thus his task is tougher. One issue Red Bull will continue to have is in qualifying. The car simply is unable to keep up with Mercedes and Ferrari over one lap, which will almost always put it at a disadvantage come race day. The gap is pretty big, and would be tough to close before the year is out. Both cars seem destined for the third row at every event in normal circumstances. There is another factor which has not really been considered also and that is Verstappen. The young Dutchman’s performances this season have generally been very good, but his luckless form has resulted in just one podium finish at the Chinese Grand Prix. However five retirements from the nine races so far (of which three have been directly down to mechanical problems) has derailed his season somewhat. If Verstappen’s car becomes reliable and he performs, then it is very much likely that he will throw himself right into the mix in the races.